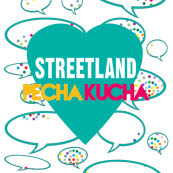 Streetland in Govanhill held a Pecha Kucha event as part of Refugee Week back in June. The event focused on community spirit and saw several guest speakers talk about community spirit from their own working and living perspectives. One of the presenters was Clem Sandison who has been involved in the local food movement in Glasgow for the best part of a decade. Check out her inspirational talk on the video below - even better invite your friends round for dinner and watch and discuss! Pecha Kucha 2012 - Clem Sandison from Streetland on Vimeo. You can follow Clem on Twitter! Pecha Kucha is Japanese for 'chit chat' and is a lively presentation format in which 20 slides are shown for 20 seconds each, enabling a fast-paced, concise ideas exchange which fosters creativity, spontaneity and experimentation.